For the planet within this system, see Terra (planet). The Terra System is the shining jewel of the United Empire of Earth. It is a strong jumping hub. Terra III commonly referred to by its system’s name, has made great strides towards becoming the cultural focus of the Empire. Terra is the only system in the United Earth Empire that is named after the capital planet, rather that the star (Terra Nova) at its center. Since the discovery and subsequent exploration of the system in 2516, Terra has grown consistently in both popularity and influence. Even during the Messer Era, Terra was one of the few systems that tried to maintain a progressive stance against the despotic reign. It was with this perseverance in the face of adversity that elevated it to be almost synonymous with Earth as the center of power in the UEE. 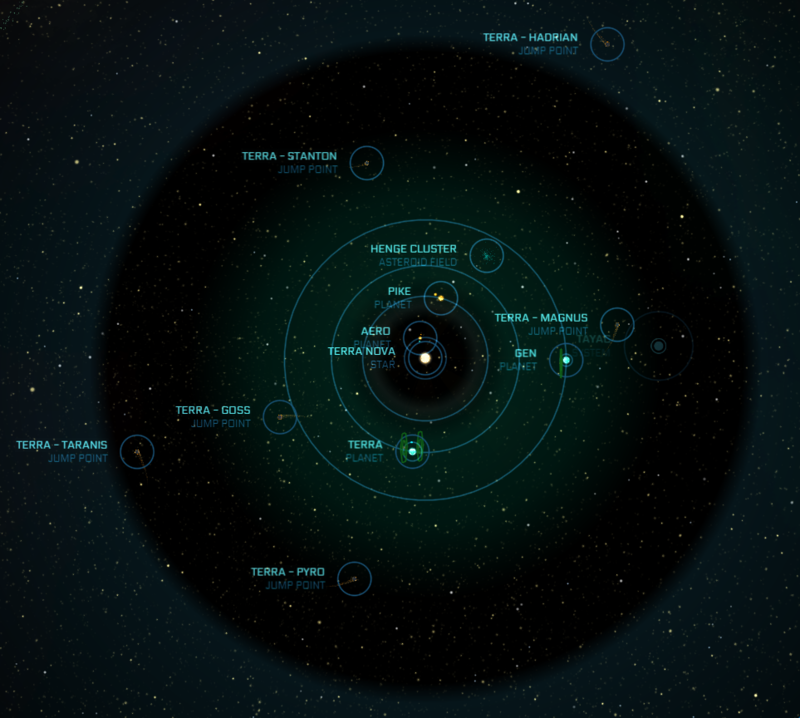 The Terra system, then designated 342A, was first charted in 2516. When the first long-distance magnetic relay images of the system’s third planet resolved, the explorer crew immediately knew they had hit it big. A natural superearth located squarely in the star’s green band, Terra III was immediately recognizable for it’s astounding similarity to an untouched Earth. Lush, verdant and brimming with natural resources, Terra’s colonization was immediately obvious. Within two years no fewer than seven colonial sloships had been dispatched to the world. Astrophysicists soon staked their own claim with a startling discovery: Terra system’s unique location and makeup meant that it was a strong jump point hub. Like Sol, Terra is a G-type main sequence star. Unlike Sol, its outer planetary system never formed. Without the mass diffusion caused by gas giants and with the star’s location in the center of a dense stellar cluster, extremely stable jump points arose easily. Thus far, five jump points have been charted and scientists believe that a sixth is almost a certainty. (Theoretically, as many as twenty-four could exist, although the odds against most of them ever being stable enough for transit are astronomical.) Exobiologists, too, had an early interest in the system: massive stone ruins clearly indicative of intelligent life were discovered on Terra III’s southern continental mass. No other evidence of this ancient civilization has yet been uncovered on the planet, creating one of the most-debated archaeological mysteries of our time. Terra III was the twelfth planet colonized by the United Empire of Earth. In four centuries, owing to its jump network and location, it has evolved into a massive trade hub. Kiel, Baker, Kilian and other name systems are short hops from the star. The world’s plentiful resources, cultivated carefully so as not to impact the environment, have fueled the Empire’s Eastern Expansion Program. Terra Nova is a Main Sequence Dwarf-G star. Aero is a mesoplanet with rich mineral deposits but too harsh of a climate to make them easily accessible. The lack of an atmosphere hasn't stopped industrial magnates from descending on the vast mineral resources on this terrestrial planet. Thousands of mining operations are in near-constant operation to help fulfill resource requirements for the system. Terra III, commonly referred to by its star’s name was the twelfth planet colonized by the United Empire of Earth. It has made great strides towards becoming the cultural focus of the Empire. Known locally as Gen, this terraformed super-Earth is situated on the further edge of the green band and is often overlooked when compared to Terra. Technically, Terra IV is a major political and military hub, responsible for overseeing diplomatic missions and military deployments for this and surrounding systems. The only asteroid belt in the Terra System is the Marisol Belt. It is located past the Terra - Hadrian jump point, on the outskirts of the system. The Henge Cluster is an asteroid field located between the orbits of Terra (Terra III) and Gen (Terra IV).